Ramming air into the induction system for greater output looks like an easy return on time and money invested. In the real world, it is not that simple. 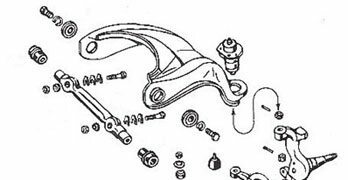 Although lowering the intake charge temperature is generally considered a guaranteed way to increase engine output, it also is not without potential problems. Indeed, in some extreme cases, lowering the charge temperature by a substantial amount such as, say, 50 degrees F, can actually lead to reduced output. It is important to understand the factors that can work in opposition to the potential positive effects of ram air and charge temperature reduction.
. A power-producing element is very obvious on this 580-hp Chevy 355. However, the fact that it contributes to output is far from obvious. If you have not guessed, it is the polished exterior surface on the intake manifold. Any moves to reduce intake charge temperature must start with attention to the amount of heat the outside source of air is likely to pick up prior to its entry into the engine’s induction system. Feeding the engine underhood air at the elevated temperature is not a good plan for performance. Some tests on my 1980 Pontiac Trans Am fully illustrate just how much loss the engine can experience when fed underhood air at typically more than 170 degrees F. This California-spec car had to meet emissions standards and was equipped with a rather anemic 305 small-block Chevy, which cranked out a supposed 190 hp. 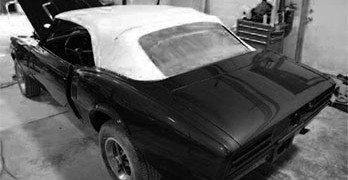 The hood shaker induction was just a dummy setup, but it could be easily converted to a functional system drawing on outside air instead of underhood air. The tests were done on a 100-degree day at the drag strip in Tucson, Arizona. On such a day, it was typically a low-17-second high- 70-mph car. When the back of the hood shaker air scoop was opened up and the underhood air sealed from entering the induction system, the car picked up a little more than 2 mph and dropped about 0.2 second from the ET, making it a high-16- second low-80-mph car. You may have noticed that the air inlet on the scoop faces backward (see Fig. 7.1). This has undoubtedly raised the question among some readers as to whether the car would have been quicker with the scoop turned around to face forward. The thinking here is that a forward-facing hood scoop should have the benefit of “ram air.” Simple theory tells us that the system should ram more air into the intake and, therefore, make more power. Sure, gains can be had from ram air. However, in reality, possible gains from ram air are overestimated and often poorly executed. Figure 11.2 shows the increase in air pressure at the mouth of a closed tube. We are looking at the pressure head generated by bringing air to a standstill at the mouth of a scoop. Of course, it works equally well by assuming that the air is stationary and that it is suddenly accelerated to speed by the motion of the air scoop on the car moving through it. Figure 11.2 shows that the pressure head developed is relatively small until the speed increases to about 100 mph. For instance, at 75 mph, the pressure head due to the forward motion is only 0.1 psi. At sea level, where the air pressure is typically 14.7 psi, the percentage increase in air density at the intake is 0.68 percent. At 100 mph, the air density increase is a little better at 1.2 percent and better yet at 2.7 percent at 150 mph. As can be seen here, ram air does not amount to much until speeds are relatively high. If the car has the capability of topping about 125 mph in the 1/4-mile, a well-designed hood scoop installation starts to measurably pay off. This setup is ideal if you want the benefits of cold air and ramming. With this setup not only is the engine being fed with cool air above ambient pressure, but the car also becomes slightly more aerodynamic. This is due to it feeding from the stagnating highpressure zone built up at the front of the car. Because this front is virtually flat, the benefits of drawing air from that location are measurable. This installation is from Air Inlet Systems. If the air is not excessively heated downstream of the point of induction, feeding the engine cool air can produce significant output gains. Although this test was on a fuelinjected engine, it is a good example of what can be achieved by drawing cold air from behind the radiator grille. On average, the temperature reduction was about 38 degrees F. This corresponded to 8 to 10 ft-lbs of additional torque as measured at the rear wheels. The cold-air kit for this test is from K&N. Putting a big hood scoop on your racer may look fast, but it is far easier to increase the drag than the power. Sure, power may increase, but the drag can increase even faster. If it does, performance drops rather than increases. 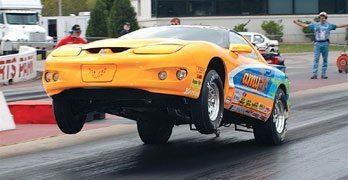 So a serious effort at ram air needs to take into account the aero drag involved as this could more than cancel out efforts to increase the vehicle’s performance. Also, in practice, the pressure head that the system should develop is not met. The reason for this is that as fast as air is fed into the scoop, the engine is drawing it out at the other end. The only performance aspect that can be guaranteed is that the air entering the hood scoop is at the ambient (outside) air temperature. From that aspect, a hood scoop is a good idea. Before we finish with the problem of additional drag from a hood scoop, I should mention that there is a way to get most of the benefits of ram air and actually cut the aerodynamic drag of a vehicle. Instead of a hood scoop, try drawing the engine’s air supply from directly behind the grille or a headlight opening. Routing the air from these locations reduces the stagnant pressure head as the vehicle is pushed through the air. Additionally it also delivers air at the lowest temperature possible. Something you must consider and deal with is pressure equalization between the fuel bowl and the amount of air fed to the venturis. If this is not taken into account, the mixture leans out as speed increases. You need to make sure the fuel bowl vent tubes experience the same pressurized air that is feeding the venturis. 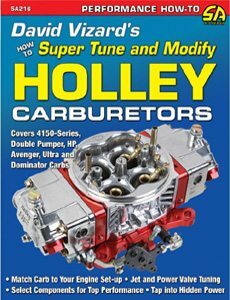 On a Holley carb this is a common consequence of installing an air filter/ram air system mounted on the carb’s air filter ring. Doing so leaves the float bowl vent tubes within the confines of the air filter/ram induction system. There are systems on the market intended to cool the air fed to the carb. Some are pretty exotic and use the cooling effect of compressed gases to cool the ducting to the carb. While such systems work, they are somewhat expensive. I have tried cooling the air to an engine via ice water in a long aluminum tube inserted into a largediameter plastic tube. While it did offer a performance advantage (about 4 hp on a highly tuned 2-barrel Pinto 2-liter engine), it was cumbersome. However, if the race regulations don’t specifically ban air temperature control, if a suitable simple system can be devised, it’s worth some serious thought. In the late 1980s, I built an octane-fuel test engine that looked at fuel detonation limits in a different fashion to that of the CFR research engine normally used for octane evaluation. Instead of having a variable CR, my test engine (a Chevy 355-ci small-block with iron heads) used ignition advance to evaluate the effects of intake charge temperature on the detonation limits of a number of service-station pump fuels. The test engine was a 14:1 unit with a set of ported factory iron heads. 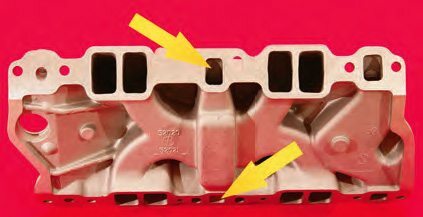 Three thermally different intake manifolds were used; all Edelbrock Performer RPM dual-plane intakes. The first had the usual exhaust cross-over passage operative so it was heated by the exhaust. In the second unit, the heat cross-over was welded shut to block it off, and to minimize heat conducted into the manifold from the cross-over port in the heads. An intake manifold gasket was installed, which was made of an insulating material, to block off the cross-over port in the heads. The third intake had the cross-over blocked from the exhaust, but the passage itself was drilled into and a water fitting installed. This allowed the manifold to be water cooled by the city water supply, which at that time of year was around 40 degrees F. The intent was to see how much power a fuel could produce at whatever advance it could tolerate before detonation set in. It is quite reasonable to expect two fuels of the same octane to produce the same results. That proved to be far from the case. These tests established several important factors that are often discussed among racers, or conversely, completely overlooked. For these tests, eight different brands of fuel were used. For a given octane, the difference between the worst and the best for any given octane was well over 30 hp. Although things have undoubtedly changed since I performed these tests, it is worth noting that, at that time, the worst fuels in terms of output were the cheap off-thewall brands. Another factor that was amply demonstrated was that a fuel that may be best at one temperature was not necessarily best at another temperature. For instance the best 90-octane fuel in the water-cooled intake test was Sunoco. However, when run with the exhaust-heated intake, it was far from the best. dual-plane intake was selected for the apparent octane tests. The difference in a fuel’s resistance to detonation over a varying temperature range is called the fuel’s sensitivity. When fuels are tested in a variable-compression CFR research engine, they are tested for “engine” octane and “research” octane. The engine octane is tested with the intake air temperature about 150 degrees F hotter than with the research value. As of 2012, the difference between these two shows up as about eight octane numbers. If a fuel is rated at 90 octane on the R+M/2 system typically used in the U.S., we can reasonably assume that the research octane is 94 (which is one of the most often quoted on the service-station pumps in Europe) and the engine octane is 86. The difference is 8. Another point worth mentioning is that a higher octane (as measured on a CFR engine) does not always translate into greater resistance to detonation in a real-world race engine. However, with these tests, one aspect was apparent across the board: Intake charge temperature played a big role in the final results. 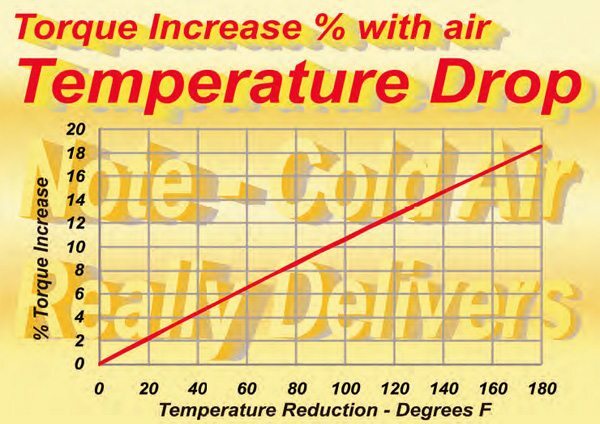 The first temperature-related factor you need to take into account is that, on average, for every 8 degrees F increase in induction temperature your engine needs one more octane number to stay out of detonation. Every time a charge temperature reduction can be made the fuel gains an apparent increase in octane value. For example, if an engine just detonates on, say, 100 octane when the intake charge temperature is 90 degrees F, the same detonation point is reached at 97 octane if the charge temperature is reduced to 76 degrees F.
There are other factors that increase octane other than reducing the charge temperature. One is an increase in charge density, which has the potential to produce more power. 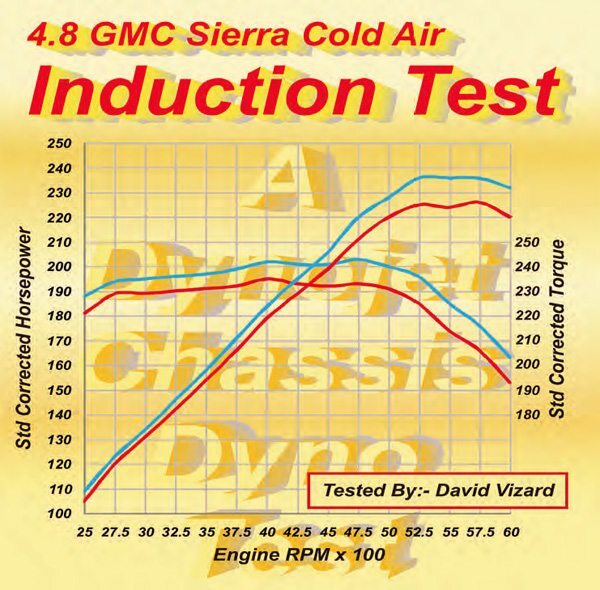 My test engine showed that the difference between an exhaust-heated intake and one with the exhaust heat deleted was, on a typical performance street 350-ci engine, typically 5 to 7 ft-lbs throughout the RPM range. The water-cooled intake delivered a further 5 to 7 ft-lbs. I discovered another interesting point. The water-cooled intake was fed water at the same 90 degrees F air temperature that existed in the dyno cell. The charge temperature, as measured at the intake manifold to head interface, was about 35 degrees F lower due to the evaporative cooling effect of the fuel. When the intake air temperature increased, the evaporative cooling increased, although it did not keep pace with the intake inlet temperature. When the intake temperature dropped, the charge temperature (due to evaporative cooling from the fuel) was reduced. These are important points to remember in relation to the subject of artificial fuel/charge cooling. The fuel temperature in the carb’s fuel bowl can have a significant effect on the engine’s output. When underhood temperatures have stabilized under fast driving conditions, fuel in the bowls is typically 130 to 140 degrees F, but on a hot day, the temperature can rise to as high as 190 to 200 degrees F and this is the borderline of a problem area. If the vehicle has poor underhood air circulation on a hot day, the fuel temperature can rise to extreme temperatures and certain fractions of the fuel actually boil. Boiling fuel is far less dense than fuel at a typical temperature. This allows the fuel bowl float to drop so more fuel floods in. This causes the carb to go seriously rich or even flood. In extreme cases this leads to a complete engine cut out. Such a situation is referred to as percolation. Gone are the days when a cool can was literally a tin can with a copper tube coiled inside and soldered into place. This unit from Moroso has a large ice/coolant capacity and a good amount of surface area on the finned-aluminum center section. The can itself is made of reinforced expanded foam that has great insulating properties. This means more of the ice absorbs heat from the fuel rather than from the underhood environment. Another phenomenon due to excess heat is vapor lock. This is when the fuel feeding the fuel pump is starting to boil. This leads to the pump not delivering the fuel it should, thus causing the engine to severely lean out due to lack of fuel. 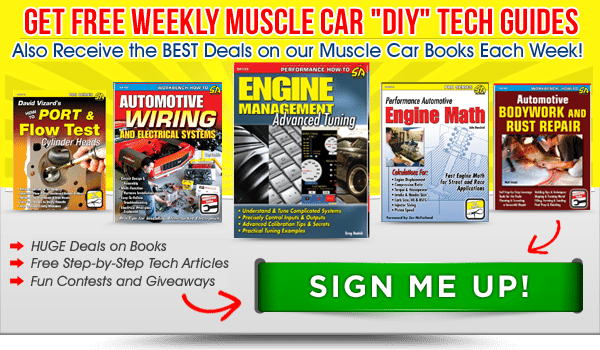 Vapor lock is far less likely to occur if the fuel pump is of the immersed type. Next best thing is to have the pump situated immediately adjacent to the fuel tank and as low as possible. All the forgoing points to one inescapable fact: If maximum performance is the goal, being conscious of fuel temperature at every stage of its handling is necessary and that starts at the point of storage. Here are a couple racing tips. The day before a race, put all of your fuel into containers and then into a large ice chest with as much ice as space allows. Also make sure the vehicle’s fuel tank is as far as possible from any heat source, such as the exhaust system. If a heat source is close some insulation work is required. The fuel line must be insulated when it comes from a rearmounted fuel tank with fuel pump, or from a tank with a mechanical fuel pump mounted on the engine. The plumbing department of any big home improvement store has split foam tubing that’s typically used to stop water pipes from freezing, and it’s suitable for installation on the lines from the tank. The split line is coated with adhesive so it can be sealed onto the fuel line. Now I want to delve more deeply into the subject of artificial charge cooling (ACC) by means of supercooled fuel and its effect on output. 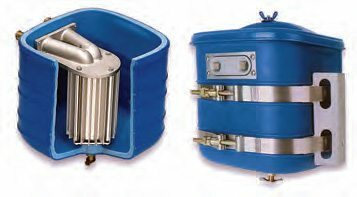 The simplest and most common way to cool the fuel entering the carb is via a “cool can.” A cool can is a simple heat exchanger. As such, it can function effectively and, if it is used correctly, the power gains can be substantial. 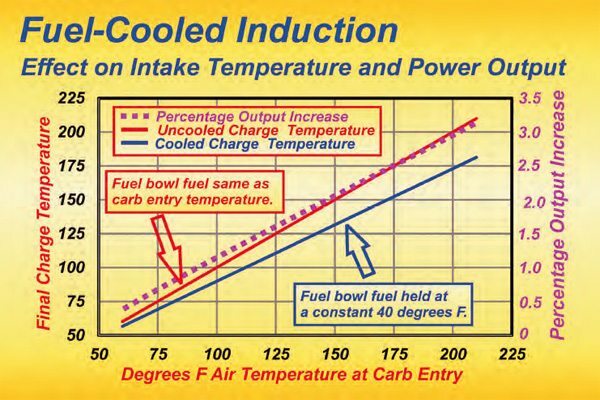 Figure 11.10 shows the air temperature reduction produced by fuel in the fuel bowl held at 40 degrees F while carb entry temperature rises from 60 to 210. Assuming a typical race blend and a 13:1 air/fuel ratio, every 5.6 degrees F the fuel entering the carb is reduced results in the potential to reduce the charge temperature by 1 degree. Ignoring, for the moment, any aspects concerning fuel evaporation, mixture quality, and effects of carb body temperature on the charge itself, the reduced charge temperature is worth a sufficient power increase to easily make the difference between winning and finishing several places down the field. The hotter the weather, the greater the difference made by cooling the fuel. However, installing a cool can alone is unlikely to deliver the full benefits of a fuel-cooled charge. Here it is worth mentioning a test I did with a fellow California racer in the 1980s. On a very hot afternoon in midsummer the effect of a cool can on a 468-inch big-block Chevy Camaro was worth about 0.1 second on what was essentially a low- 11- to high-10-second car depending on track and weather conditions. But this was an extreme case. Simply installing a cool can (especially on a 1/8-mile drag car) can be far less productive unless the setup is suitably refined. The biggest problem here is that, unless steps are taken to the contrary, the cooler fuel does not begin to have a significant effect until the vehicle is about 150 to 200 yards off the start line. That is because the fuel bowl is initially full of warm/hot fuel and the carb body is hot. This means quite a lot of cooled fuel must pass through the system for it to cool the carb body and the air by any significant amount. Testing a cool can system on the dyno showed that the engine did not produce its best output until the cooler fuel had run through the system for at least 20 seconds. If you are drag racing, the run is long over with at the point the system gets into full swing. This Moroso cool can was used in the Malibu that I race with my partner David McCoig. It is positioned as close to the carb as conveniently possible to minimize additional heat absorption. Note also that all the fuel lines are insulated with foamrubber tubing originally intended for protecting household plumbing from freezing. 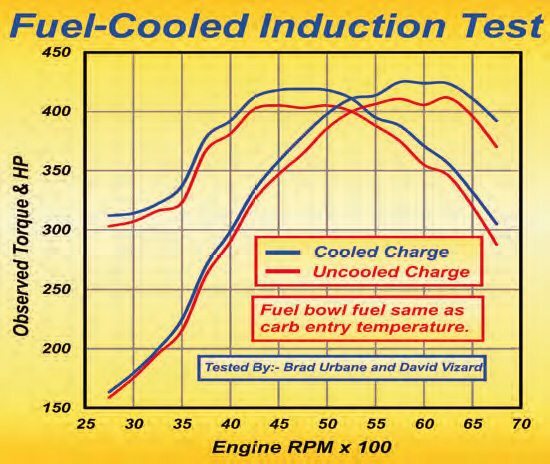 This graph shows the theoretical gains that super cooling the fuel provides before the fuel enters the carb. The red line represents a typical situation in which no artificial cooling of the fuel is used. The blue line indicates the charge temperature after the air has been mixed at a 13:1 ratio with fuel at 40 degrees F. The higher the ambient temperature, the greater the effect of super-cooled fuel. The super-cooled fuel affects output by increasing torque. When racing in hot weather, super-cooled fuel produces a distinct advantage over a vehicle not so equipped. Before utilizing a cooled fuel system I first drain the fuel from the tank and the fuel bowls. Previously cooled fuel is then poured into the fuel tank. The fuel line is disconnected at the carb and the cooler fuel from the tank is pumped through an already ice filled cool can through the pressure regulator, the carb fuel log, and into a spare gas can. This cooled the fuel system as a whole and the lines from the cool can to the carb even more so. Next the carb is sprayed with a mixture of 25-percent water and 75-percent alcohol. The high latent heat of evaporation of the alcohol takes all the excess heat out of the carb. With the carb now cold to the touch the insulated fuel lines are reconnected. When all is buttoned up the car is pushed (or towed) to the staging area. On my 1/8-mile restricted-spec (had to run a stock out-of-the-box dual-plane intake) Malibu, the cool fuel tactics paid off (as tested on a 75 to 80 degree F day) to the tune of about 0.004 second on a 6.3-second car (that’s about 9.7 for the 1/4-mile). Going to all this trouble on a 1/4-mile car typically produces proportionately better results. For a 1/4-mile car in the same speed and ET range you can expect to see an ET reduction of 0.010 to 0.015 second. So why did I see such a small gain on the Malibu compared to a big-block Camaro? 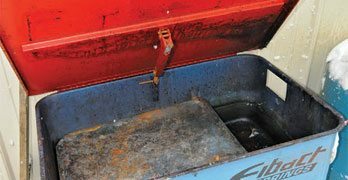 The answer here is that prior to installing the cool can I was already fuel-temperature conscious in as much as I always use cooler fuel from an ice box and all the fuel lines were insulated right up to the carb’s fuel rail. 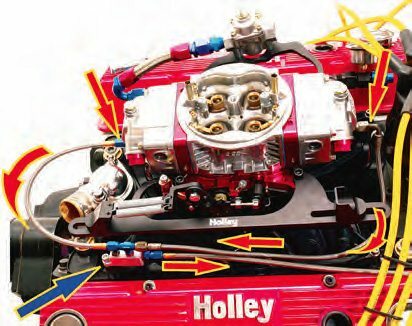 When Holley introduced the center-drain fuel bowl it opened the door to a straightforward way to pre-cool the fuel system right up to and including the carb. Figure 11.12 shows an installation on one of my dyno mule engines. Here is how it works. This thermally controlled carb setup is not yet covered with insulating foam. Depending on the type of fuelpressure regulator being used (see Chapter 12), fuel either enters at the standard regulator or returns to the tank from the bypass regulator. If a standard regulator is used a fitting (red/white arrow) plugs the outlet. If a bypass regulator is used this is the “fuel in” port via the cool can from the fuel pump. Although either type of regulator works, the best choice should be a standard regulator. Used in this manner the standard regulator never dead-heads the fuel pump because fuel is always being bypassed by virtue of the flow out of the fuel bowls. From the regulator, fuel is fed into the carb’s fuel log and into the fuel bowls. The two red arrows at either end of the carb show where the fuel is being drained from the fuel bowls. From there each line enters a distribution block via a T junction (blue arrow). The red arrow leaving the fuel distribution block indicates the direction of fuel flow to the scavenge pump. This pump returns the fuel to the fuel tank. Previously cooled fuel is fed into the Moroso cool can where it is cooled considerably by a mixture of ice and antifreeze. In addition to this a little dry ice for a super-cooling effect (does not need much) is usually added to the mix. Paying attention here has produced fuel temperatures exiting the cool can as low as 20 degrees F. This fuel is then pumped into the carb’s fuel bowl where it cools everything as it passes through and out of the fuel bowl drain. A small scavenge pump connected to the drain hose ensures a fast fuel throughput and returns the fuel to the fuel tank. With this system everything downstream of the carb is fully cooled prior to making a pass down the track. So, it looks as if fuel cooling of the induction system is a slam-dunk procedure for achieving greater power output. As is so often the case, however, things are not quite that simple. There are some factors that actually add to the potential power increases but there is also a major factor that, unless satisfactorily addressed, conspires to reduce the chance of really positive results. Let us first look at what is potentially a major pitfall in the quest for maximum output. When fuel is cool, less of it vaporizes. If the cooling is carried out to an extreme as is being proposed here, there may be insufficient fuel vaporization for a good start to the combustion event. This results in a reduced output even though the charge is cooler. If, after installing a super-cooling cool can system, the vehicle shows no performance improvement, it is a sure-fire bet that the mixture characteristics (other than air/fuel ratios) need to be investigated. When a thermally managed induction system or a super-cooled fuel system or both is used, the usual problem is that the booster, if optimal for a conventional induction system, now delivers fuel that is insufficiently atomized. 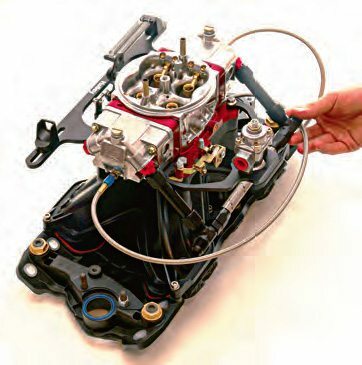 Using an Ultra HP carb centerdrain bowl makes it easy to plumb in a super-cooled fuel system. 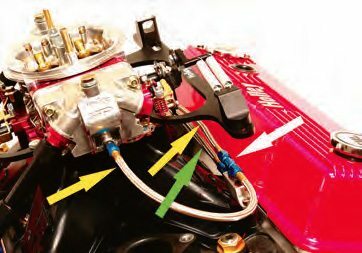 The fuel lines (yellow arrows) lead from the fuel bowl drains. These are connected to a tee junction (white arrow) that is in turn fitted into a junction block. Leading from this junction block is a fuel line (green arrow) that is connected to the suction side of a small electric fuel pump with a capacity of 30 gallons per hour. The preferable fix is the reevaluation of the booster style employed and if possible changing to a design having superior atomization characteristics. Typically this can mean going from a stepped dog-leg booster to an annular discharge booster. Sounds like a lot of work but you can take some solace in the fact that if the carb is marginally too small under normal conditions it may be okay with the booster when a supercooled fuel system is used. If you are already using a raceblend fuel, ask your fuel supplier for a blend with more light, front-end hydrocarbons in the fuel than whatever you are currently using. If they don’t have one, order some straight toluene and try progressively adding that to the fuel. Up to a point the extra toluene acts as an ignition enhancer in most fuels. It is also lighter and evaporates easier than most other fuel formulations. As long as the CR is not over about 13.5:1 you can also add small quantities (up to about 5 percent) of acetone or methyl ethyl ketone (MEK). Both evaporate very easily and can make up for the reduced vaporization experienced by the cooler charge. Do not use more than about 5 percent as it may lead to an earlier onset of detonation. If you decide to run either of these compounds as additives in your fuel be aware that, as hydrocarbons, they do not register as illegal in a fuel check. Also, since they ignite very easily you may need to back out the ignition timing by a few degrees. If you are running an alcohol-based fuel, in colder weather the addition of up to 5-percent acetone or MEK makes for easier starting and more power. The more you cool the fuel to reduce overall charge temperature, the less the charge is cooled by the effect of evaporative cooling. The truth of the matter is that, at least with gasoline, the effect evaporative cooling has on power is usually overrated. In practice, the fuel’s evaporative cooling makes the air denser, but the fact that fuel had to be evaporated to do so is largely offset by the fact that a portion of the fuel has turned from a liquid to a gas. The evaporated fuel takes up about as much space in the manifold as the difference it created by cooling the air in the first place. The volumetric efficiency then changes very little. My experience is that most dyno tests to establish the effect of evaporative charge cooling are actually mixture-quality tests. The extra vaporized fuel in the charge has led to a better combustion process and this is where the extra power comes from. Because the cool fuel reduces the amount of fuel evaporated, finer fuel atomization takes on greater meaning. Ideally, the best situation is to have a very large portion of the mixture in the form of fine fuel droplets (5 to 10 microns) and have minimal fuel evaporation while in the intake manifold. These fine fuel droplets react, at the time of combustion, about the same as vaporized fuel. Tests indicate that minimizing the amount of fuel vaporized in the intake and optimizing the average fuel droplet size produces the best volumetric efficiency from the engine. The optimal droplet size can vary from engine to engine. 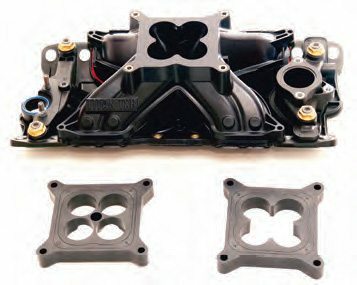 This AFR Titan plastic intake manifold is made for a Chevy small-block. It keeps the intake charge between 20 and 40 degrees F cooler than with a typical aluminum intake. Also it usually works best with one or more of the supplied spacers. The Titan is actually a multi-piece intake. Apart from its thermal virtues the fact you can see clearly down each of the runners makes it much easier to port match. Note the brackets and throttle linkages on this installation of a cooledfuel setup. These are only as far away as your Holley on-line catalog and they make for a much better functioning system. Another small effect that works in your favor is that the significantly cooler carb body actually flows more air as well as further cools the incoming charge. I did some simple tests with a pair of 650 carb bodies and a pair of 850s; they both showed some interesting differences. One carb body of each model was put in a freezer at 20 degrees F for a few hours while an identical carb body was kept at room temperature of 75 degrees F. Each body was then tested for flow at 1.5 inches of mercury. 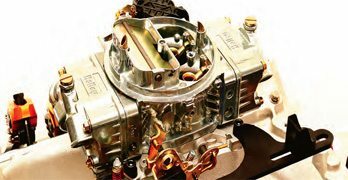 Each of the carb’s four-barrels was tested separately. The bodies were then reversed and the room-temperature bodies put in the freezer while the others were allowed to warm up. The tests were repeated and measured before and after flow and exit temperatures averaged out. The 650, with its smaller venturis, responded slightly better that the 850 to the cooling procedure. The exit air temperature dropped close to 4 degrees F, compared to the exit temperature of the uncooled body. Airflow was up by about 2.5 cfm per barrel. The 850 delivered a reduced exit temperature just shy of 3 degrees F and was up on flow by about 1.8 cfm per barrel. 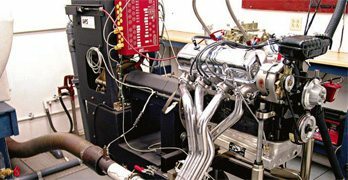 My first serious dyno test of ACC potential was in my dyno shop with the late Brad Urbane of the Carb Shop in California. We used a modified 650 mechanical secondary carb that produced a flow of about 715 cfm with the stock main venturis. The increased flow was the result of slimmed-down butterflies and shafts and a quick polish job on the otherwise stock venturis intended only to remove any slight casting imperfections. Brad had modified the carb body to allow a booster swap without having to remove the carb from the engine. The fuel bowls were drilled at the floor so a scavenge tube could be connected to a small electric fuel pump to return fuel to a small dyno fuel tank. An antifreeze/dry ice heat exchanger cooled the fuel in the tank. 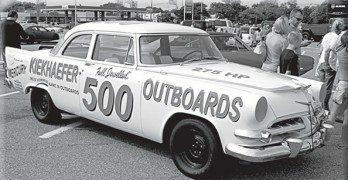 The test engine was a mildly modified Chevy small-block 350 with a 12:1 CR that cranked out a nominal 430 or so hp. The heads were a set of factory iron 186 castings, which I had previously ported to a decent race spec. 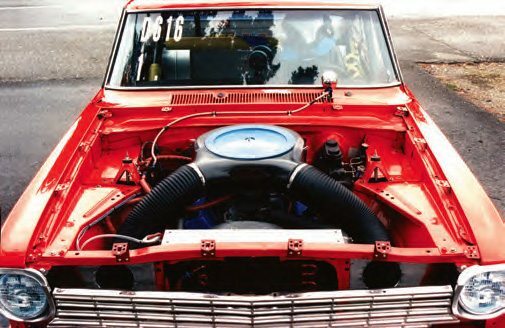 An Edelbrock Victor Jr intake was used. 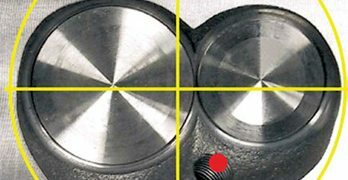 The cam was a single-pattern, hydraulic flattappet grind of about 218 degrees at 0.050-inch lift and 10:1 CR. The ignition was an MSD unit with advance/ retard control right on the dyno console. This allowed for nearly instant ignition timing changes, as I anticipated that different fuel temperatures probably needed slight timing changes to show the best of a coolerrunning induction. 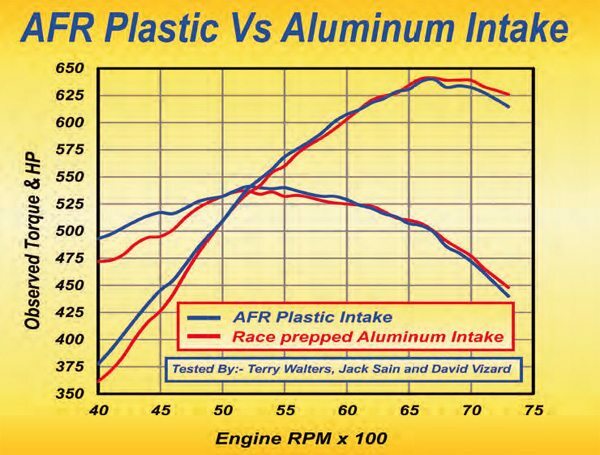 This graph shows the difference in output of one of my tricked-out smallblock Chevy aluminum race intakes versus AFR’s plastic Titan intake. Not only is this manifold a featherweight, but also its cooler-running characteristics are worth the sort of power increases seen here. For these tests, I wanted to simulate track conditions. Therefore, observed figures were used (not corrected ones, as would be seen in early summer in Southern California). The dyno cell room was at about 100 degrees F and the fuel hovered around the 90-degree mark for the uncooled baseline tests (red curves). By the time this fuel had been in the carb body a short while, it had heated to about 100 degrees F. By circulating cooled fuel at about 25 degrees F, it was possible to hold the fuel bowl temperature around 30 to 32 degrees. After reoptimization of the boosters and ignition timing, the engine produced the figures shown by the blue curves. Figure 11.18 shows the results of this test. Note that they are uncorrected observed figures. The purpose of showing the observed figures, which were done as A-B-A tests just minutes apart, is that this is what would have been seen at the track under running conditions. Just for the record, the correction factor for the day of the test was 1.076 so the corrected fuel-cooled output was 451 ft-lbs and 442 hp. The gains make for interesting reading. First, peak torque climbed by 13.3 ft-lbs and occurred about 100 rpm sooner. Peak power rose by 12 horses, but the output rose by 17 ft-lbs and 22 hp at 6,750 rpm. 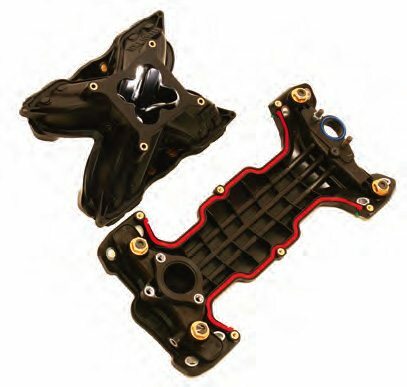 This ability to hang on to the power at the top end pays off by allowing the upshift to be made at higher RPM. These results did not come from a fuel temperature change only. The test fuel was from Daeco Fuels in California. To arrive at the best combination, the carb was run with three different booster styles. It was found that, with uncooled fuel, a stepped dog-leg booster was the best, with the straightleg and annular discharge boosters producing measurably inferior results. 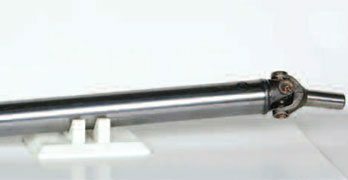 With the cooled fuel tests, the straight-leg booster, which was designed for use with a heated intake as per a stock production vehicle, had dramatically less output. However, the annular discharge booster’s performance was markedly better than when used with the uncooled fuel. So much so that it was a close call between it and the stepped dog-leg booster’s performance. At the lower RPM, the annular discharge booster was marginally better, but at high RPM it was marginally worse. Another point to note is that (on the test engine, at least) the cooler charge needed a degree or so of additional timing. The need for more advance, though, doesn’t seem to be a universal thing, so some experimenting with timing is almost certainly needed. As you can see, there is more to making full use of super-cooled fuel than just doing a good job of actually cooling the fuel. Having covered the most likely problem areas, let me sum up the conditions under which super-cooled fuel works best. First, as expected, such a system works best when the weather is hot. Second, it works better when the induction is restricted somewhat. For instance, if you are running a 750- cfm carb, but the engine makes just a shade more on an 850, then the cooled system delivers better performance. 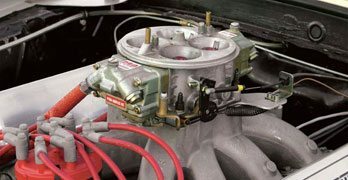 If the class of racing you run calls for a severe restriction, such as the mandated use of a 2-barrel carb or a restrictor plate, this system can pay off big time. 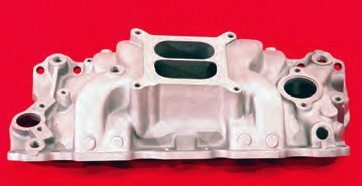 If you are using a thermal-barriercoated intake manifold or manifold and intake ports, be aware it’s more difficult for the boosters to produce a sufficiently atomized charge. The chances are you may have to use every trick in the book to get a good charge light off but it will be worth it! 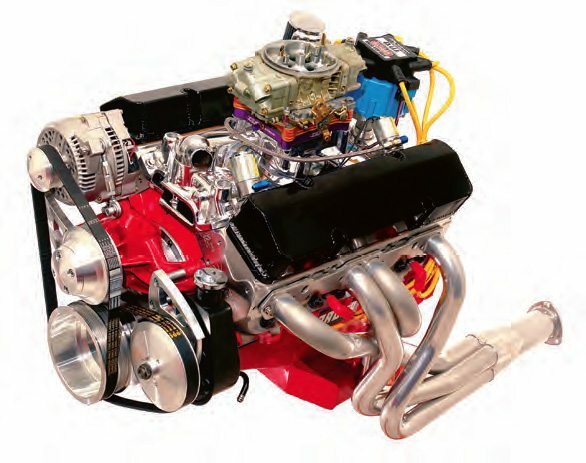 The visually obvious, but not often seen as such, aspect of the engine shown on page 100 is the shiny exterior finish on the Edelbrock Victor Jr intake. Such a finish reflects heat that otherwise heats the intake manifold. The benefits are hard to realize on the dyno because cell conditions are vastly different than those for an engine installed in a vehicle. Also the benefits on a drag race car are most likely minimal, but for a high-performance vehicle that is run hard for long periods (such as a road racer), the benefits of a highly reflective intake are, on some vehicles, actually measurable in reduced lap times.